Updates classic VWs to have intermittent wipers. Utilizes the stock two speed wiper switch and motor for a totally stock appearance. 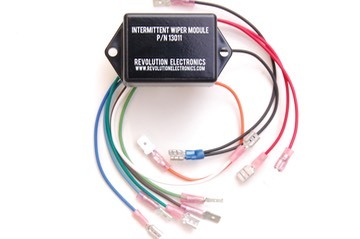 This module was designed specifically for the VW Bugs and Vans. Now your classic VeeDub can include this feature. AND it does so while allowing you to keep your stock switch so the interior continues to look original. No need to change your stock switch or stock motor. Just wire in this module behind the dash, between the switch and harness. "How are you able to use the stock switch and motor?" you ask? Obviously, we can't use the switch in the typical manner with each position being a unique delay setting or speed. Our module contains a microprocessor running software which uses the switch's three positions to sequence through a series of modes. We like to describe these modes as "rungs of a ladder". Each rung is a delay setting or a wiper speed. The lowest rung of the latter is the longest delay (about once every 8 seconds). The next rung up is the next shorter delay (about once every 5 seconds). The third rung up is the shortest delay (about once every three seconds) with the fourth rung being a continuous (stock slow) speed. The highest rung is the stock fast setting. The stock switch has three positions. Leaving the switch in the middle position (normally the stock slow speed setting) tells the software to stay at your current rung of the ladder. Moving the switch briefly to the fast setting and back to the middle position tells the software to move up one rung. Moving the switch briefly to the off setting and back to the middle tells the software to move down one rung. Need a shorter delay? Just move the switch to the fast postion and back to the middle position to move up one rung of the ladder. You can instantly move up to the top of the ladder by leaving the switch in the fast setting and you can instantly move to the bottom of the ladder by leaving the swich in the off position. Another analogy for the way this works is to think about how some of the modern automatic transmissions use a slap-shift position on the console. Move the selector into this position and you slap the handle up to shift up one gear or slap it down to shift down one gear. Need to go down two gears? Slap the handle down twice. Moving up or down the "rungs of the ladder" works the same way. 2”x1.5”x1” plastic enclosure with mounting tabs. Three delay periods: one swipe every 8 seconds, once every 6, and once every 3. Simple installation, no cutting or splicing required. 30 day money back guarantee when purchased from our eBay or Amazon store.